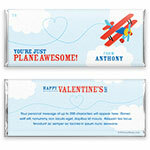 This retro-inspired Valentine wrapper design is perfect for the boys in your life. Design: Bi-plane in flight with clouds and blue sky. Personalization: To and from spaces, front message, back title and message.